Kards by Katie Kreations: Having Fun with a Tiddly Inks Halloween Hop! Having Fun with a Tiddly Inks Halloween Hop! 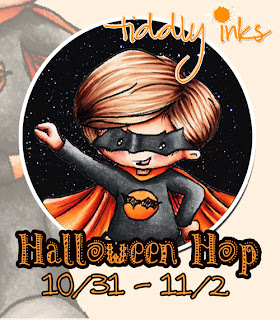 Welcome to the Tiddly Inks Halloween Blog Hop! Today, we are celebrating our favorite time of year with a beautiful and fun hop for all of you. Are you ready to get your Halloween on? You'll have until November 2nd to hop with us. There are many blogs along the way and we'd love for you to leave a comment on each blog. Leaving a comment will make you eligible for a chance to win a most fabulous prize; a $10 gift certificate to anything digital in our store! The winner will be announced on November 3rd! Along the way you will see a number of NEW Tiddly images you've never seen before. It's a bit of a sneak peak as the release isn't until tomorrow. Make sure to join us back on the Tiddly Inks blog tomorrow for the new release and a chance at winning your choice of THREE of the new digital stamps!!! I hope you enjoyed my make- have fun on the rest of the hop- I promise you won't be disappointed! Ready to keep hopping...then get going! What a wonderful idea! Love the colours and the Image! This came out fantastic Katie. I think the roses are the perfect touch. Happy Halloween sweetie! I am loving the texture on this tag! What a beautiful piece! Happy Halloween! This is fantastic!! Love how created it! Gorgeous design! Oh WOW! Fun, creepy and beautifully done! Cute vampire project! Nice coloring! That cheesecloth really makes the project! In fact, all the elements are well put together! One of my favorite Tiddly Ink images!! Wonderful project! Thank you for the blog hop stop!!! Awesome, awesome hair..wow...This is a great project..i can see this would be quite popular as a decoration! This is awesome! Just love it! Love the composition with the coffin! FANGtastic! The cheesecloth really makes it, too! How can such an angelic face have fangs like that?!? Great card. What a neat project! I love your coloring of those cute vampires! This casket is cool! I especially love how you colored her hair! Great design--the cheesecloth and roses are a great finishing touch! FANGtastic! 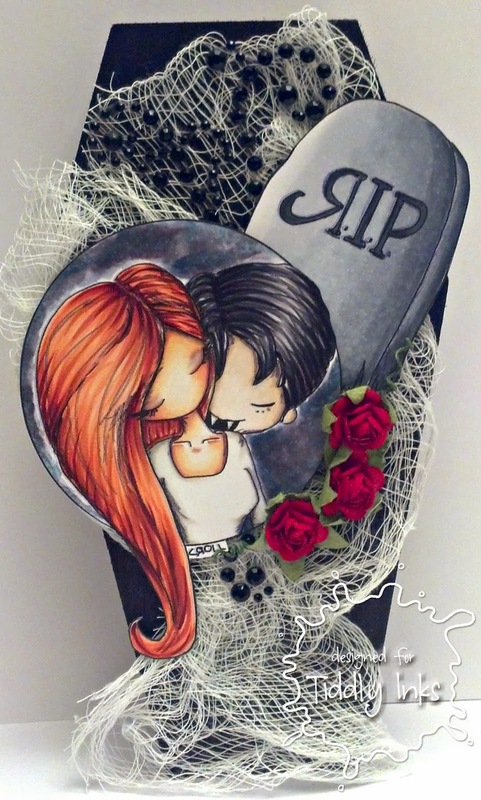 I love the idea of the coffin, what a cute idea. Awesome job, Katie! So perfect for Halloween! Great creation. The coloring and the embellishments are great. Ooooh, awesome project! Perfect for Halloween. Look at how creative you are!! That's awesome. What a great project you've made using this fun image. You did a wonderful job on this and the casket is sweet! Love the casket and cheesecloth, perfectly spooky!